Two months into the school year, and the race for Cabela’s School of the Year presented by Abu Garcia is beginning to heat up. Currently Adrian College has a strong hold on 1st place, but the rest of the team in the top ten are separated by only 600 points. We’ve seen in the past that teams that jump out to a strong lead can often hold off the challengers the rest of the year, however, there are so many major events on the horizon that nobody can predict what’s ahead. The first major event of the year, the AFTCO Collegiate Bass Open, will be held this week and will most certainly shake up the standings from top to bottom. 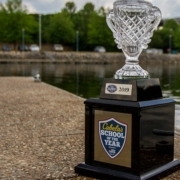 The event will be at Lake Dardanelle in Russellville, AR and already has a large field of teams from across the nation registered, including Adrian College, Grand Valley State University, Murray State University, McKendree University, and 2018 Cabela’s School of the Year winners, Bethel University. Set to take place October 12th-13th, the AFTCO Collegiate Bass Open is the first tournament of the 2018-2019 Cabela’s Collegiate Bass Fishing Series. Since this is an Association of Collegiate Anglers (ACA) event, the amount of SOY points on the line this week will be doubled. The overall winners will earn 500 points, teams finishing from 2nd-100th will earn SOY points, and schools with multiple teams finishing in the top 100 will earn points for their two highest finishing teams. This means that if a school finishes in 1st and 2nd place at the AFTCO Collegiate Bass Open, they will earn 995 total points. One school looking to take advantage of this points system and add to their current points total is Adrian College. This marks the third update in a row in which the Michigan anglers sit atop the Cabela’s School of the Year presented by Abu Garcia. With a total of 2,345 points, Adrian College has a 470-point lead over 2nd place. “There is no doubt that being in the lead is where you want to be. It definitely generates some additional excitement within our team, as well as our team sponsors,” says Head Bass Fishing Coach Seth Borton. 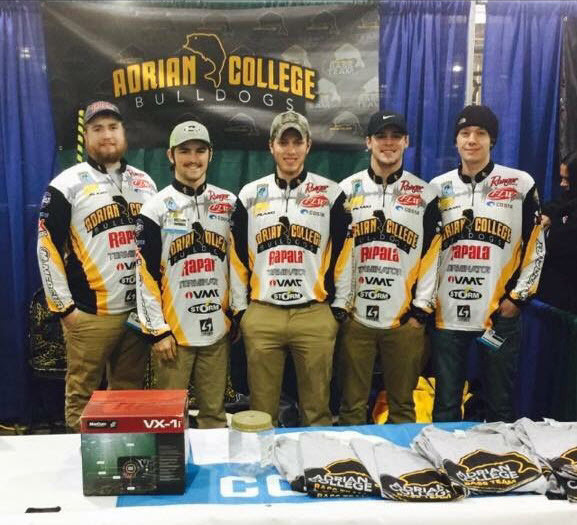 At the closing of registration late last week, Adrian College had 3 boats registered to fish the AFTCO Collegiate Bass Open. Of those anglers that are registered, only one has any level of experience on Lake Dardanelle. Borton is confident his guys have the skill to place well, “Only one of our team members fishing this event has any experience fishing Dardanelle, so it’s definitely going to be a challenge. Fortunately, we have been in this spot all over the country, and it boils down to making good decisions based on all the relevant factors surrounding tournament waters.” Adrian College hopes to be positioning themselves at a chance to earn a good deal of points at Lake Dardanelle this weekend, but the lack of experience on this body of water will be a storyline to keep an eye on as the tournament unfolds. Another team that is very familiar with the top 3 in the SOY standings this year is Bemidji State University. Sitting in 2nd place, just 15-points ahead of 3rd, Bemidji State is continuing to have a very successful year. Their recent top 15 finish at the FLW Central Regional on Lake of the Ozarks helped to catapult the team from Minnesota into 2nd overall. The Cabela’s School of the Year is designed to determine the best of the best over the course of a full tournament season. So far this year, Bemidji State University is standing up to this challenge. From each event which Bemidji State has managed to earn points, they have not earned less than 360 points at any one given event. 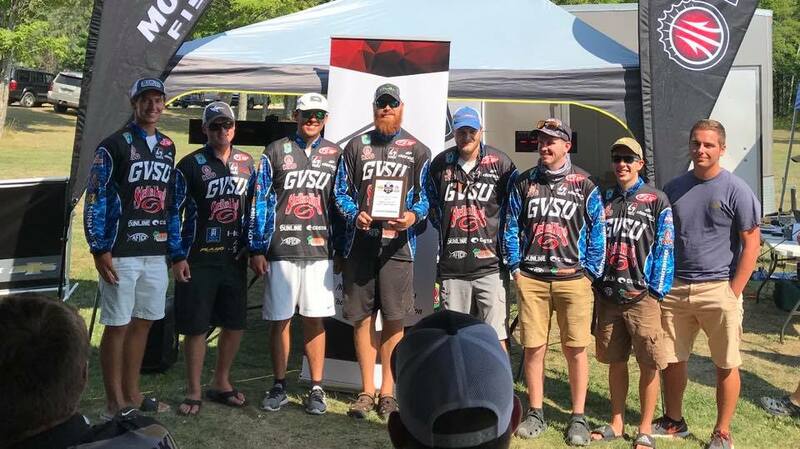 Grand Valley State University plans to continue to prove they belong by competing at the AFTCO Collegiate Bass Open. Murphy, along with fellow teammate Bill Matthews, will make the trip from up north in hopes of earning valuable points and fishing what they feel most comfortable doing. “We see that it (Lake Dardanelle) is a river system and we have been told before that it is similar to the Grand River that we have right next to our campus in Michigan. We’re hoping to be able to cover water and fish whatever is in front of us. Ideally, we’d like to be able to flip heavy cover,” says Murphy. The team will not make it to Russellville in time to pre-fish. So, with just one team participating, and minimal knowledge about the body of water, it will be very important for Murphy and Matthews to have a high finish if they plan on maintaining a top 3 spot in the standings. Lake Dardanelle in the fall will present a challenge for these anglers, but there is also a chance for great success. Last year’s winning team from Murray State University took home top prize by weighing in fish averaging around 3.99 lbs. An early poll of those competing in this event shows they believe the winning weight will be around that same mark this year. “For a two-day event, I’m sure it will end up around the 40 lb. mark. If the fish are still holding firm to their summer patterns, it may take slightly under that. But if the fall binge kicks in at any point, it can easily be over the 40 lb. mark,” says Seth Borton, Head Bass Fishing Coach at Adrian College. Once the anglers begin their official practice in the coming days, we will begin to get a better idea for what stage these fish are in. Along with being hosted in the fall for the first time, this also marks the inaugural year for AFTCO to be the title sponsor of this event. This news has created a ton of buzz and excitement. “AFTCO’s involvement within the bass fishing industry and college fishing has been amazing this past year. AFTCO just started introducing their brand to the freshwater community in 2018 and it’s amazing to see how it has grown in college fishing as well,” says Lucas Murphy from Grand Valley State University. As a company, AFTCO pledges 10% of all profits towards conservation. At the AFTCO Collegiate Bass Open, AFTCO will continue to show their support of both college fishing and conservation with their Bank Bag initiative. Anglers will be asked to fill these yellow bags with trash from the areas surrounding the lake. Upon turning in a full bag, the angler will receive a $25 gift card. It is setting up to be a great week at Lake Dardanelle. 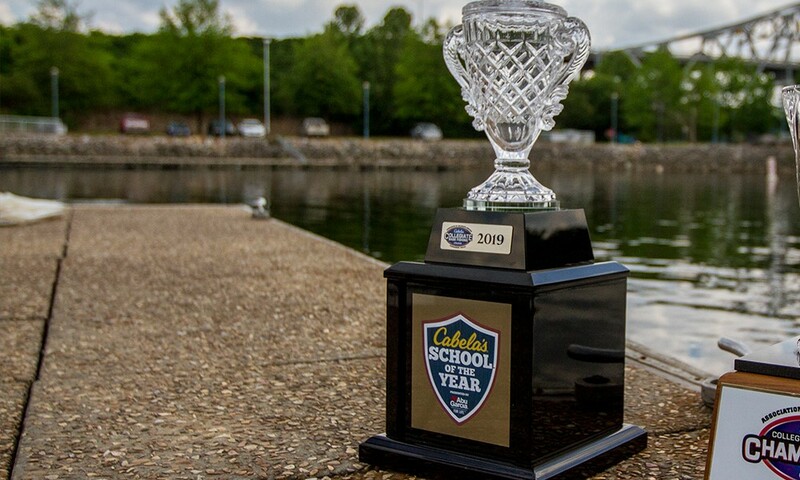 A great fishery combined with valuable prizes and crucial Cabela’s School of the Year points on the line should result in an exciting next couple of days. Be sure to keep up with all of the action from the AFTCO Collegiate Bass Open by following along with the live blog on our website each day. The Association of Collegiate Anglers (ACA), a division of CarecoTV, is a tournament organization created to facilitate growth, development, and structure within competitive collegiate bass fishing. The ACA created the original BoatUS Collegiate Bass Fishing Series,14 seasons ago, which is now the Cabela’s Collegiate Bass Fishing Series, and the longest running collegiate bass fishing series in existence. The ACA provides support to dozens of school operating regional events nationwide, and owns the Cabela’s Collegiate Bass Fishing Series, Cabela’s School of Year Program, and associated assets. The ACA also provides the largest amount of televised coverage of any collegiate fishing series with dedicated programming on several television networks ranging from Discovery Channel, CBS Sports, NBC Sports, Pursuit Channel, World Fishing Network, as well as other regional and national networks. For more information on the ACA or the Cabela’s Collegiate Bass Fishing Series, visit www.CollegiateBassChampionship.com. For more information on Cabela’s, visit www.Cabelas.com. For more information on CarecoTV, visit www.CarecoTV.com. University of Louisville College Open RESULTS Live Blog: October 11 – Final Practice Day!